Instruction for use: Use as condiment for Chinese dishes. Ingredients: Mustard Green (80%), Water, Salt, Preservative (E211, E202, E223), Colouring (E102), Acidity Regulator (E331), Antioxidant (E301). 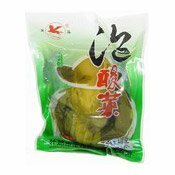 Simply enter your details below and we will send you an e-mail when “Pickled Sour Green Mustard (天馬泡酸菜)” is back in stock!